Tag Type: .035 in. Thick Type 430 Stainless Steel. 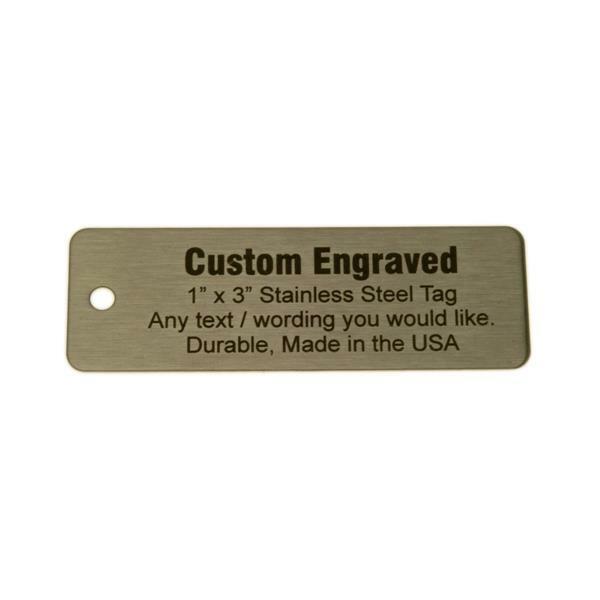 Our stainless steel tags are engraved using a fiber laser, which means your engraving will not rub off. The black engraving is a result of the laser beam changing the metal with heat to produce your wording. Extremely durable and suitable for harsh enviroments our stainless steel tags are used for keys, valve tags, parts and equipment identification and any other use. Price includes engraving on one side, second side is optional and an additional cost. Max. 40 Characters per line..